There is no guarantee the examples will work with other versions. 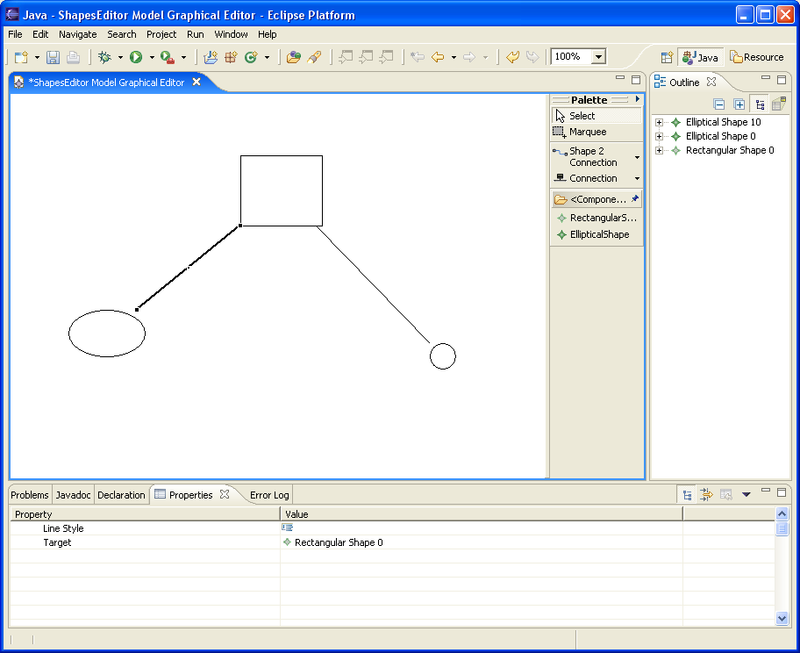 The Graphical Editing Framework (GEF) assumes that you have a model of some type. The type in most cases, is a set of custom Java classes created to suit the needs of an application. Overlaying the model, users would implement their own observer pattern. For example, when an object changes state, GEF becomes aware of the change, and performs the appropriate action, such as redrawing a figure due to a move request. Users spend time building their own viewers (i.e. properties) and deciding how the model should be persisted. Most novices learning GEF don't realize EMF can help with several modeling issues previously mentioned. The Eclipse Modeling Framework (EMF) is a Java framework and code generation facility for building tools and other applications based on a structured model. EMF consists of two fundamental frameworks: the core framework, responsible for basic code generation, and runtime, responsible for creation of Java implementation classes for a model. The EMF.edit framework builds on the core framework to add support for generating adapter classes that enable viewing and command-based editing of a model. Furthermore, EMF provides a free adapter that listens for model changes, a requirement when building a GEF editor. In addition, EMF includes default support for persistence using XMI or XML (you can write your custom persistence layer by extending a few classes) . The purpose of the article is to build upon the shapes example that was extensively evaluated in a previous Eclipse Corner article . 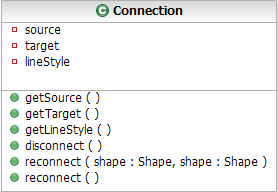 The shapes model currently exists as a custom set of Java objects, this article illustrates how to transform the shapes model into an EMF-based model. The transformation occurs in two major steps: mapping custom Java objects to an EMF model, and modify EditParts to use the new features available in EMF. The base class of all shapes model objects. It serves two main purposes: notification and property source support for the Eclipse property viewer. This class will no longer be needed when transitioning to EMF because EMF provides the necessary facilities to listen for model changes and EMF.Edit provides property support. A container object to hold a collection of shapes. A connection between two shapes codified into a source and target connection. An abstract class that represents a shape. It includes various information regarding visual representation, including the source and target connections of the object. Special classes that represent two types of Shapes: rectangular and elliptical. To transform the simple shapes model, we must map it an EMF model. This can be accomplished in many ways (i.e. XSD, Java, UML) and is discussed further at the EMF documentation site . For simplicity, this article will only focus on using annotated Java as EMF input. 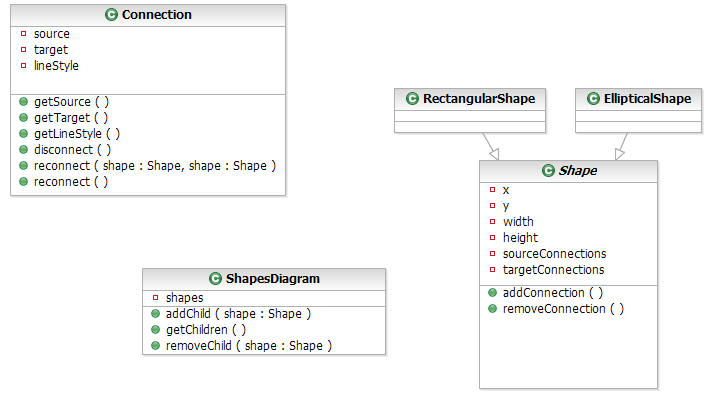 Listed below are sketches representing the old shapes model and their corresponding annotated Java models. After we have these models, we can use EMF to generate the rest of the code needed to interact with our models. A tutorial is available that describes how to generate an EMF model from annotated Java . Before I discuss how to add properties to your EMF model, I would like to bring up the issue of notational model and semantic model separation. It is considered good design to separate visual information from semantic information. In the original shapes example, there was no logical separation of the notational (visual) information, like size and location, from the semantic information. For simplicity, this example will not separate visual information from semantic information. Note the original shapes example didn't have semantic information unless you can imagine the shape model having a name attribute that would specify the name of a shape. If you are curious to see this type of separation, the Looking to the Future section discussed in this article contains information of interest. Eclipse provides a properties view that allows for the manipulation of currently selected object properties as long as the object adheres to the IPropertySource interface. In GEF, AbstractEditPart checks if its model implements IPropertySource, if so the model is returned so the Eclipse properties view can take advantage of it. Eclipse 3.1 features a common command infrastructure  that projects may pick up. The Graphical Modeling Framework (GMF)  is an upcoming project and is discussed in Looking to the Future section. The Merlin Generator Framework  discussed in Looking to the Future contains examples of using EMF.Edit with GEF based editors (there's also an example in this article). 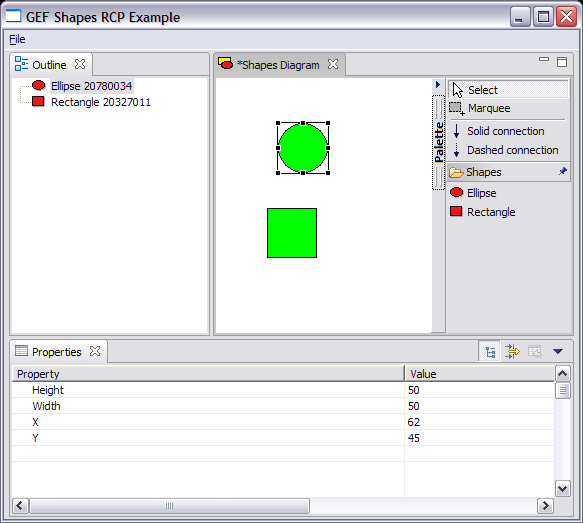 Examine GEF 3.1 EDiagram example  (older version used EMF.Edit to display properties). In order to take advantage of Eclipse properties views we create classes that implement the IPropertySource interface. To investigate how this is accomplished, it is recommended to look at AbstractPropertySource and its implementers. 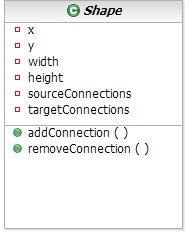 Listed below is an example implementation, ConnectionPropertySource which needs to define how a property is retrieved and set. In GEF, the EditParts act as controllers and receive notice of input and then properly direct changes to its model and view objects. It also keeps track of connections between the model objects and any other communication. In the original shapes example , every model object extended the abstract class ModelElement which included support for adding and removing listeners from model objects. This type of behavior is possible with EMF since every EMF Object (EObject) is also a Notifier which supports listening for objects. We'll use the EditPart that represents a shape in the new example. In ShapeEditPart we added a convenience method hookIntoModel which provides the ability to pass a model object and add a listener to the model. In order to add listeners to EMF model objects, our listener (the EditPart) must implement the Adapter interface. An important part of this interface is the notifyChanged method which serves as the point where we will analyze the types of changes that happen to our EMF model and act on them. Furthermore, EMF provides the ability to filter based on the type of notification your listener receives, whether it is a set, add, remove, etc... (take a peek at the Notification class for what other filters exist). The first case is when a visual value like x-coordinate, y-coordinate, width or height is set. Once we establish that a set happened on any of these visual elements, we can properly call the refreshVisuals method to redraw the figure. The next case is when a source connection or a target connection is removed or added. Since we know what type of connection is added or removed, we can tell the EditPart which type of connections need to be refreshed. There has been a considerable amount of work done trying to unite two of the most popular Eclipse projects: EMF and GEF. In this section, I will discuss some of that work and where it is headed. Also, this section serves the ancillary purpose of pointing you to more complex examples if you gain mastery of the example discussed in this article. The GEF 3.1 release will include a new example (see Figure 2) that lets you visualize and edit EMF models (Ecore). The source code is available in CVS and is viewable online . This example is fairly complex, but it illustrates how to separate notational (diagram) logic from semantic (business) logic. It accomplishes this by creating an EMF model EDiagram that represents the diagram logic. Inside this model is the typical information associated with diagrams: location, size, incoming connections, outgoing connections, etc.... The semantic information is provided in the EMF model (.ecore file). I believe the Shapes EMF example will serve as a good stepping stone in understanding the complexities of the EDiagram example. The GMF  is a new Eclipse project that is currently in validation phase and entering the implementation phase soon. The goal of GMF is to form a generative bridge between EMF and GEF, whereby a diagram definition will be linked to a domain model as input to the generation of a visual editor. The main components of GMF will be a diagramming infrastructure that will provide a set of base diagramming components that serve as a target for the next component, a diagram generation framework. The Diagram Generation framework will use the diagram definition input and generate code that is part of GMF's final component, in addition it will provide exemplary modeling tools . I encourage readers to browse the GMF newsgroup and webpage  for more information. I believe the GMF project will address a lot of the current concerns with building GEF editors based on EMF models and make the process a lot easier. Merlin is a free Eclipse plugin (EPL) , based on EMF, that provides enhanced code generation and model transformation tools. Also, Merlin comes with a set of wizards and editors for customizing code generation and model transformations (including a JET file editor with syntax coloring, code completion and validation). An interesting subset of Merlin includes a built-in GEF generator (created with Merlin's own mappings and templates) that allows users to generate GEF editors from any EMF based model. Similar to the EDiagram example, this GEF generator produces editors that store semantic and notational information in different files. Additionally, the generator options can be amended so custom figures are used for the EditParts. There are more features contained with Merlin that won't be discussed since I deemed them outside the scope of this article. Note that some of the features of Merlin may end up in the GMF project as Merlin is a possible initial contributor. To show the capabilities of Merlin and add some excitement to this article, I used the shapes EMF model as input to Merlin and generated a functional GEF editor (see Figure 3) that uses EMF for its model. It took me all of a few seconds to create a fully functional EMF-based GEF editor. I recommend users to look at Merlin once they are familiar with the basics and look to tackle more complex problems. Note, there are two examples with Merlin: There is a .gefgenmodel included with the shapes EMF example and there is a separate contribution by the author of Merlin that shows off a bit more advanced generation. Bonus: Shapes Example goes RCP! I spend a considerable amount of time browsing the Eclipse newsgroups and one of the questions that comes up frequently in regards to GEF is how to use my GEF editor in an RCP based application. I believe this question is going to get asked more as the Eclipse 3.1 release sufficiently increases the ease in building and deploying RCP-based applications. So, for my last magic trick and to reward readers who got to this point, I'll discuss how to convert the original shapes example into an RCP-based one and provide the code! If you are unfamiliar with RCP, the RCP FAQ is a good start. The conversion of the shapes example into an RCP-based application is a lot simpler than most people think. The problem stems from the setInput method of ShapesEditor expecting an IEditorInput, but the most familiar editor input people work with is IFileEditorInput. The problem with IFileEditorInput is that it belongs to the pesky org.eclipse.ui.ide plugin which is not an acceptable dependency for an RCP-based application. The solution to this problem is to simply create our own editor input, ShapesEditorInput which implements the IEditorInput interface via IPathEditorInput interface. Once this change is completed and the setInput method is properly changed in ShapesEditor to use ShapesEditorInput, we can now properly open a shapes editor. Note, the sole purpose of this example is to demonstrate how to get a GEF editor inside of an RCP application, it doesn't include support for various actions such as saving or wizards (I leave this for the reader to explore). This concept of creating your own IEditorInput can be applied to creating editors that aren't file based (i.e. 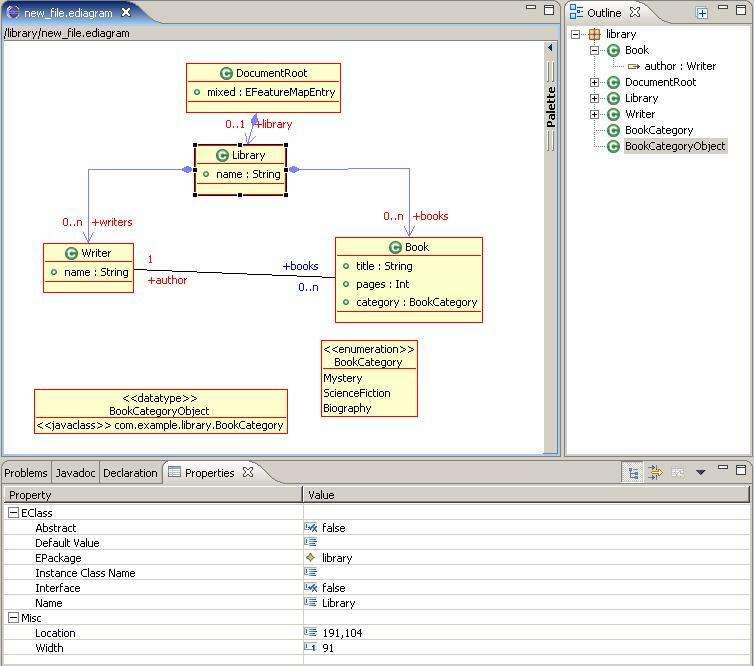 an editor which is based off of data from a database). Richard Gronback for information regarding GMF. Joel Cheuoua for various corrections regarding Merlin and updating my Merlin example. Ed Merks for half the posts on the EMF newsgroup, his screenshot and for his feedback on this article. Sushma Patel for reviewing the article and correcting my horrible grammar.